The North Korean soldier who defected to South Korea surviving 40 rounds of gunfire through the Joint Security Area last Monday is recovering quickly but has inactive tuberculosis and hepatitis B, the attending doctor said. The patient has identified himself as a 24-year soldier, Lee Cook-jong, a trauma specialist at Ajou University Hospital, told reporters on Wednesday. The patient has breathed without an artificial respiratory device since 9 a.m. last Saturday, and his fever has disappeared. 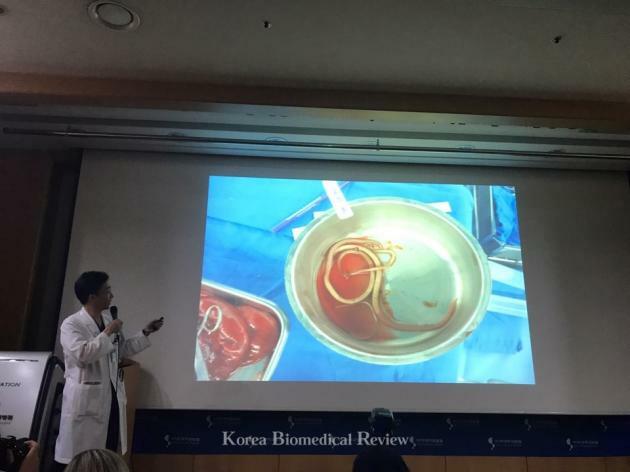 The North Korean defector will need further treatment, examination, and observation in the trauma center due to possible worsening of wounded areas infected with parasites and hepatitis B, according to the doctor. Lee Cook-jong, a trauma specialist at Ajou University Hospital, explains the condition of the North Korean defector, during a news briefing on Wednesday. Lee has treated the parasites found in the man’s intestines – confirmed to be Ascaris lumbricoides and Toxocara canis – using antiparasitics since the patient became able to take medication. “Right after he was able to drink some water, I gave him pills for the parasites. It’s not a serious concern anymore. The problem is the viruses can proceed to become chronic diseases. I think the patient will be okay once he is diagnosed by the proper internal medicine doctors,” Lee said. The patient currently suffers from liver problems that initially caused jaundice, and is taking medication for hepatitis B and weakened liver functions resulting from hemorrhaging. Inactive tuberculosis does not need treatment but will need further examination, the doctor added. “We cannot put our guards down because a patient who recovers this quickly may also deteriorate exceptionally quickly once they run into side effects,” Lee said. The soldier will be moved to a regular ward once he can eat liquid food such as porridge, the doctor said. The patient can drink only water now, but the doctor will move the patient to a regular ward by Sunday. Lee said the soldier shows signs of depression and possible trauma, and he is talking with the patient mostly on topics of music and baseball. The U.S. Army air medics transported the patient to Ajou University in Suwon, Gyeonggi Province, by 4:53 p.m. last Monday. The patient lost more than 50 percent of his blood before arriving at the hospital and almost died. “He was in a seriously ill state. The patient had no palpable pulse, the air medics said. He was almost dead. The only reason he survived was that (the air medics) performed an (emergency) textbook procedure well. The cabin crew has an excellent paramedic,” Lee said. Right after he came in, the doctor transfused him with more than 10,000 ccs of blood, Lee said. “We used a total of 42 pints of donated blood to keep him alive. He doesn’t have any of his blood in his body,” he added. The patient has four confirmed gunshot wounds -- in his left posterior chest, left armpit, right upper arm, and right knee, Lee said, adding that his team had thought it had to amputate his arm but was able to save it in time later.